In case you missed Day 1, start here! With only four days in this magical city, we had a long list of things to do, eat, drink, and see. 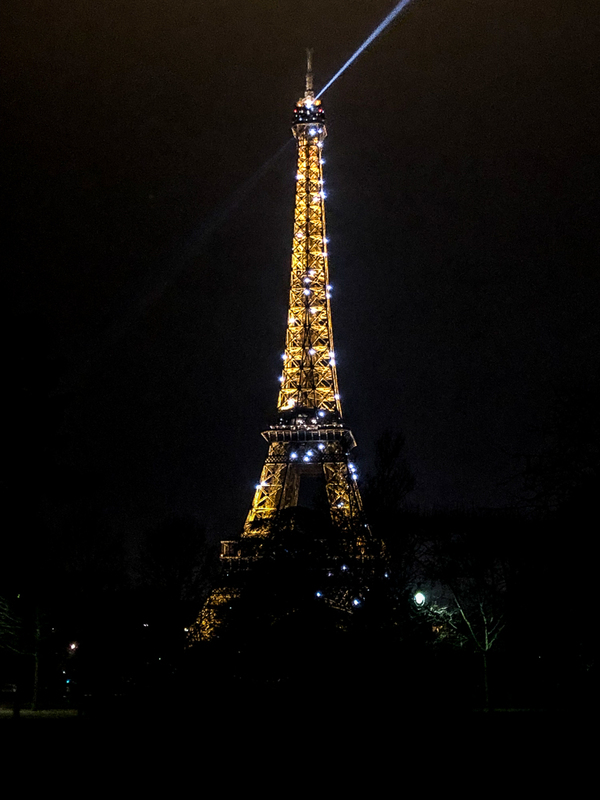 From a glorious seafood tower, to wine by the Eiffel Tower at night, this was one of my favorite days of our vacation. 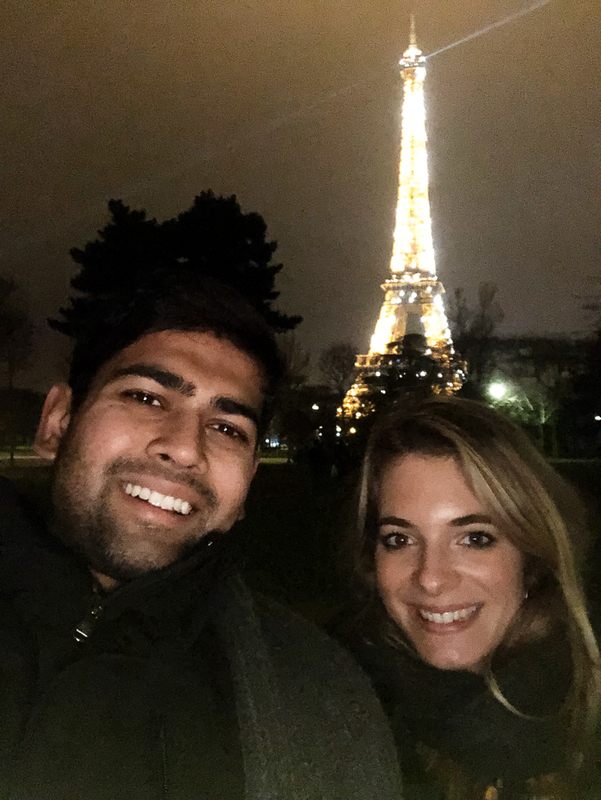 I keep asking Rishil if we can go back and re-experience everything that we did from this itinerary, and he usually meets that request with a look that says “I want to throw a croissant at you”. Maybe next year.. In the meantime, you all can go and I’ll live vicariously through you. 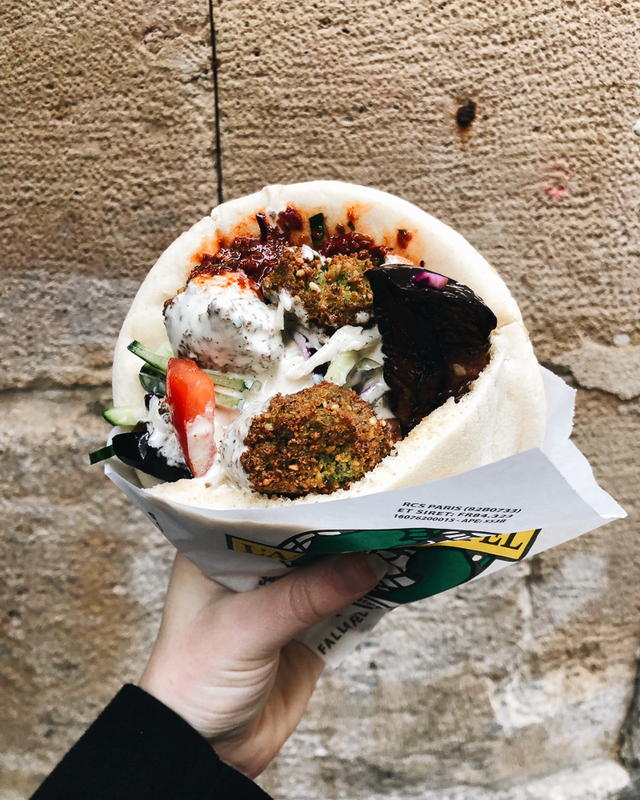 It may be an unorthodox breakfast, but we started the morning with the most famous falafel in the City, L’as du Fallafel. 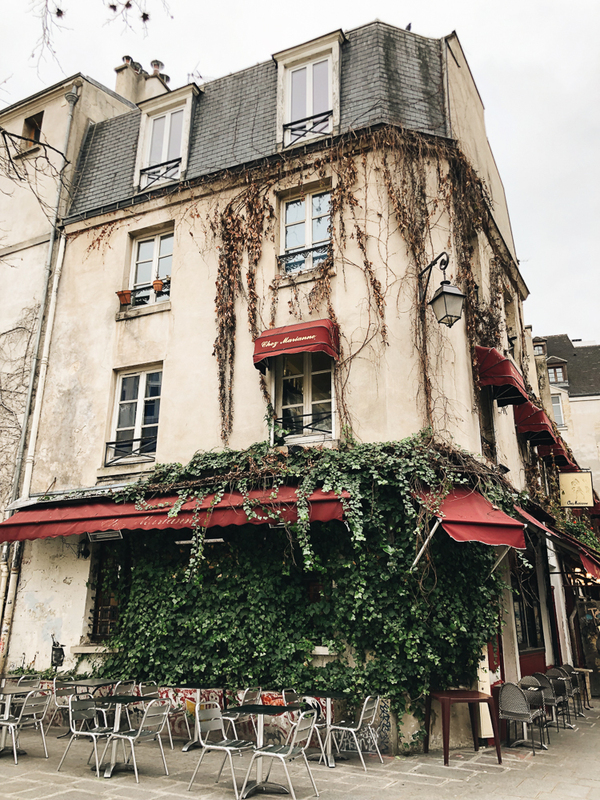 It’s on a small side street in Le Marais, and had a crazy long line by 10am! There are two lines, one for a sit down restaurant and a much shorter line for the to-go spot. Unlike Georgetown Cupcakes, the wait for this place is actually worth it. 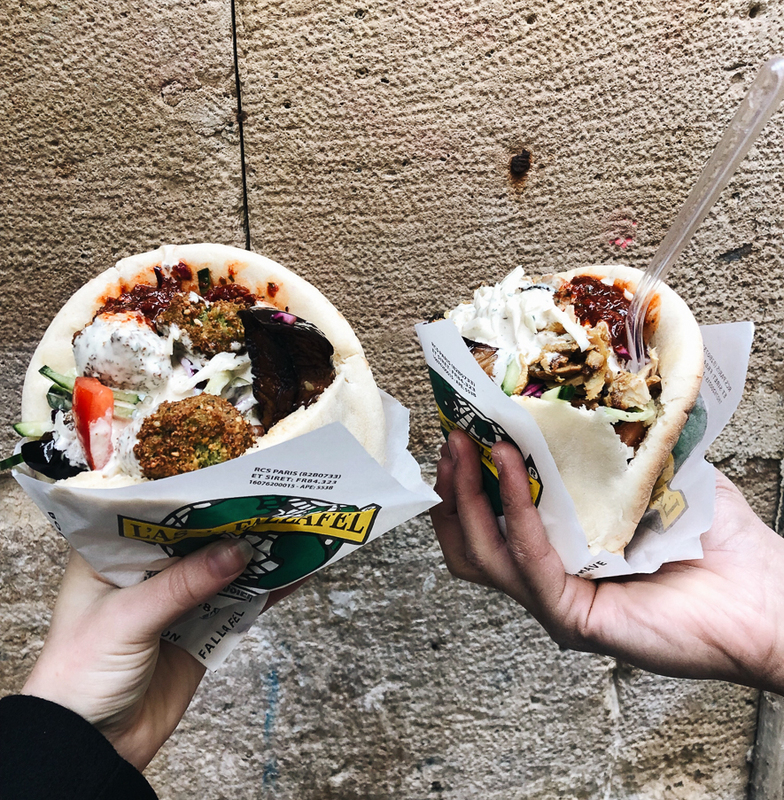 Trust the person making your pita, and tell them to add everything (including the hot sauce). 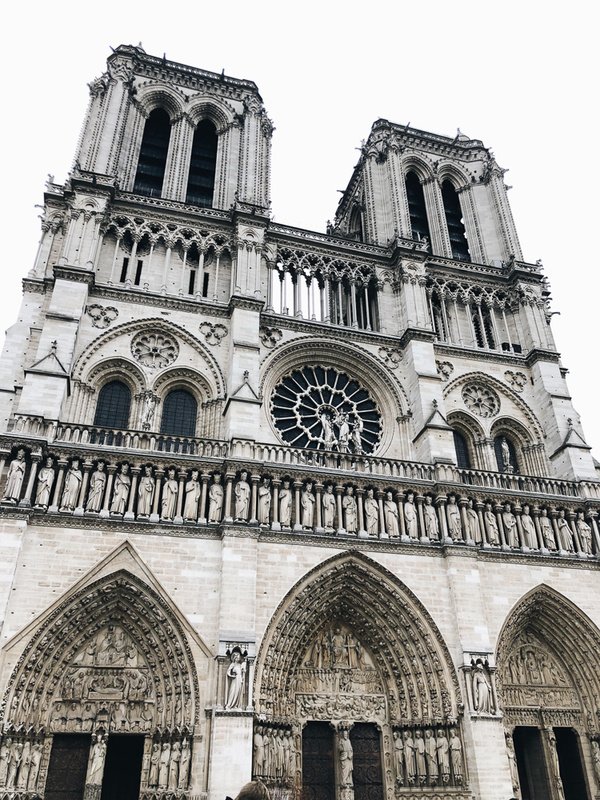 We then walked off our breakfast and headed towards the Seine to go see Notre Dame. 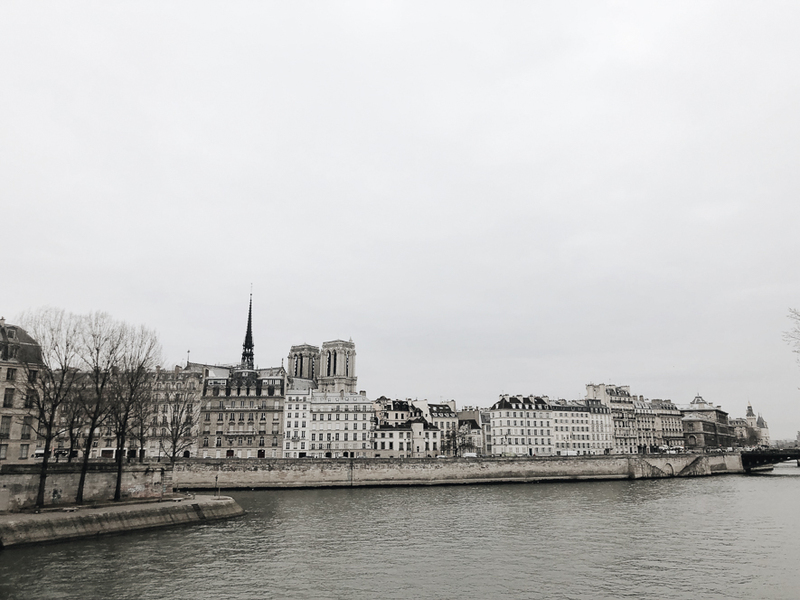 Despite the cold, the walk across Pont Saint Louis was so beautiful. 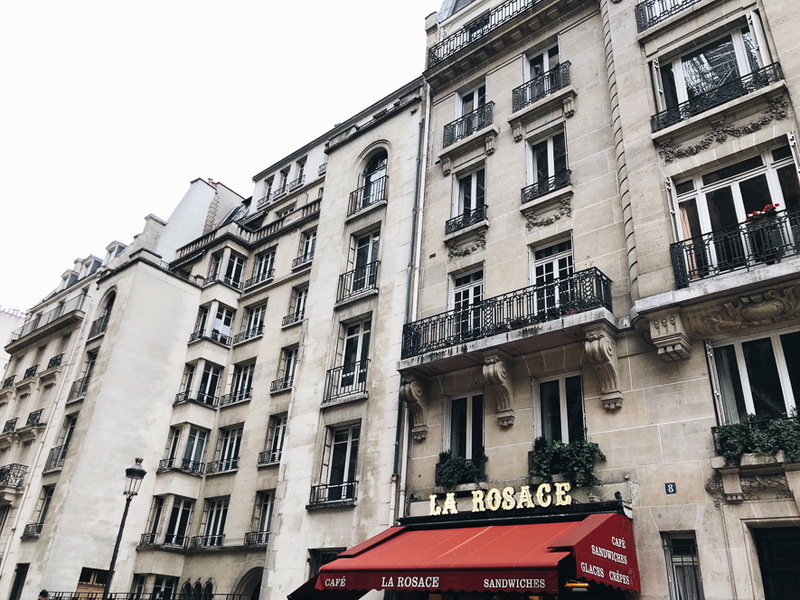 The ivory colored buildings, the gray-blue water, and the bright red awnings on top of the corner cafes are so quintessential Paris. 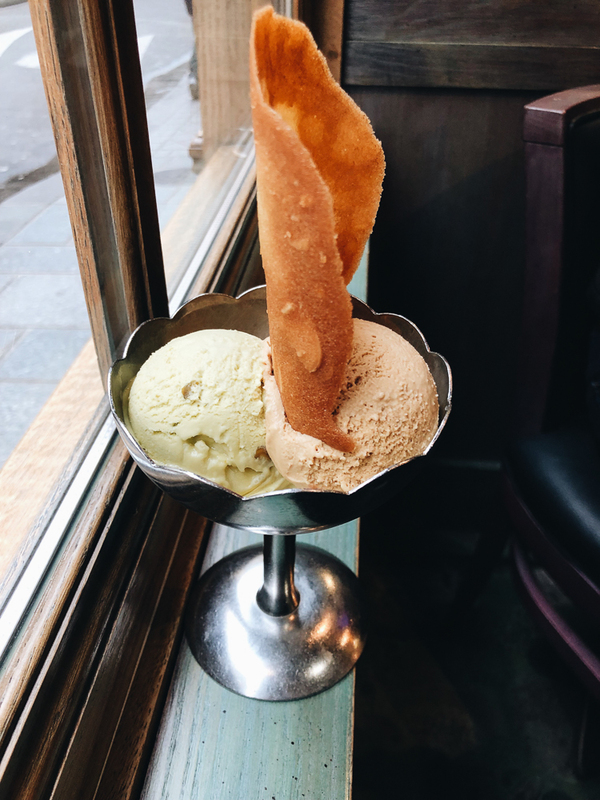 Right near Notre Dame is a legendary ice cream shop called Berthillon. I’ve had a lot of ice cream in my day, with Salt and Straw in Portland being at the top, but I’ve never tasted such true flavors like the ones they churn here. The salted butter caramel has a depth of flavor that comes from deeply caramelizing the sugar and mixing it with the the best quality of butter and just the right amount of sea salt. We also had the pistachio, which was the essence of pure pistachio. Even in the winter, it’s a can’t miss stop. 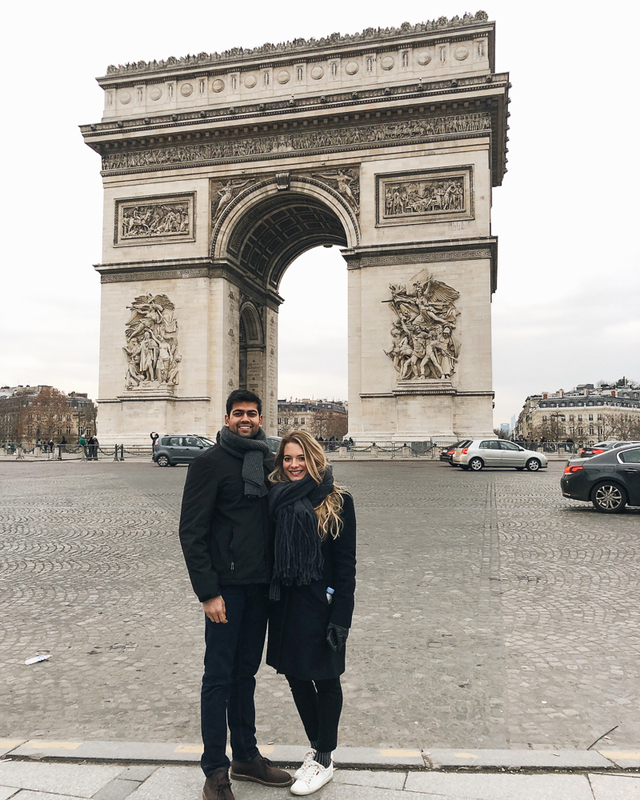 Our next stop was the L’arc du triomphe at the Champs Elysees. 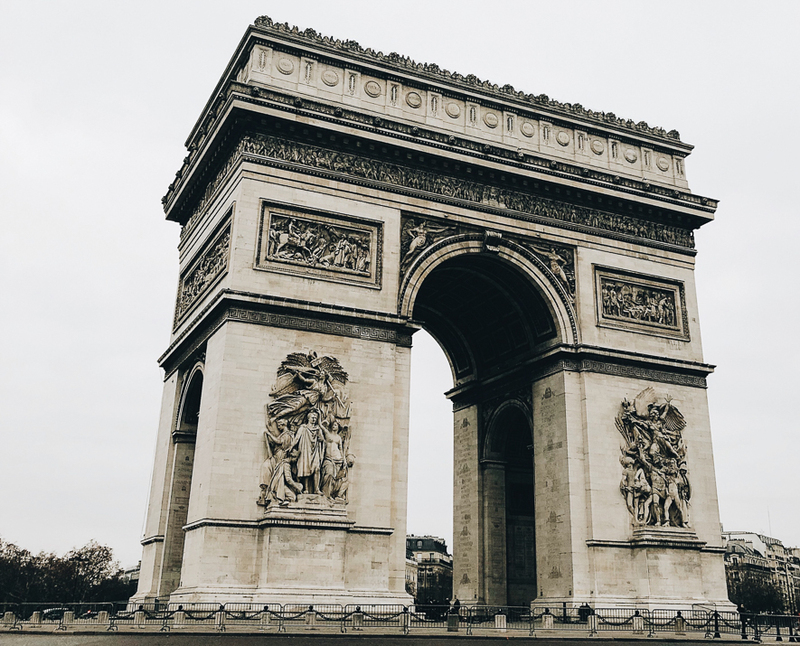 The Champs elysees is a gorgeous area famous for the best shopping. 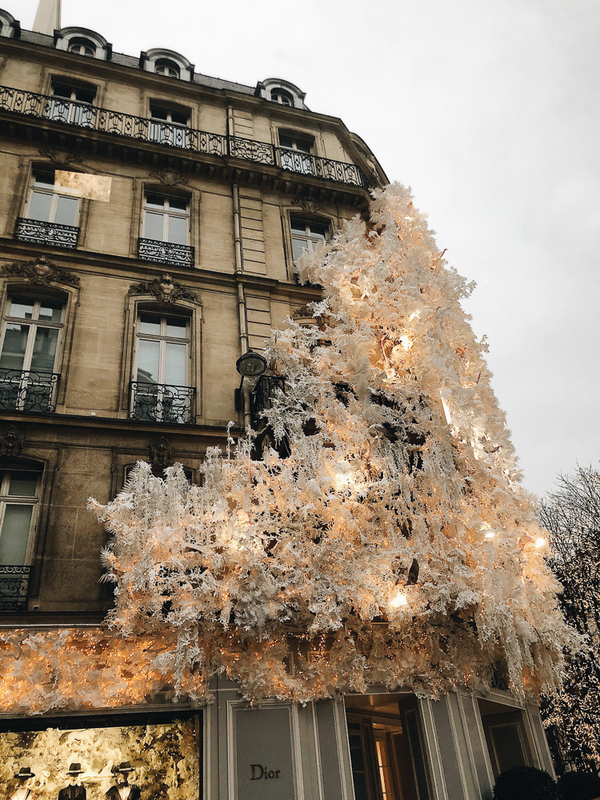 The trees were draped in string lights, and holiday decorated designer store after designer store lined the pedestrian only street. We wandered into Louis Vuitton, since I wanted to splurge on something to remember our trip by. I was strangely nervous walking into their flagship store expecting someone like Meryl Streep circa The Devil Wears Prada, but was greeted by the kindest employees and rows of the most beautiful leather handbags. We started out in the men’s section since Rishil desperately needed a new wallet. We had champagne, and they brought out more wallets than we even knew existed. Rishil decided on a bi-fold in a navy leather, with his initials stamped in red. 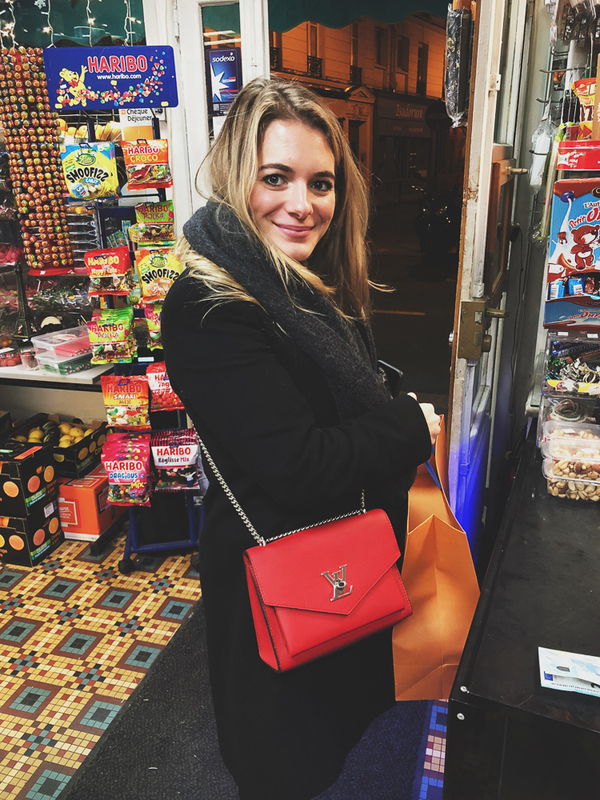 I hesitantly wandered to the women’s section, and found a red leather crossbody that somehow made my outfit with sneakers look amazing. I was sold. 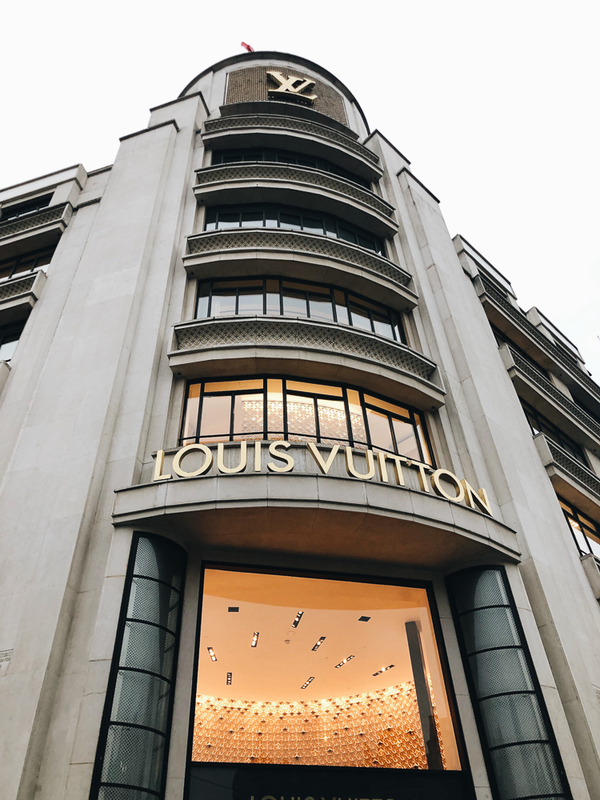 The service was superb and we love seeing our gifts from the trip; the experience at Louis Vuitton was really a highlight of our time in Paris. After the shopping, we were starving again and so excited for our dinner plans. 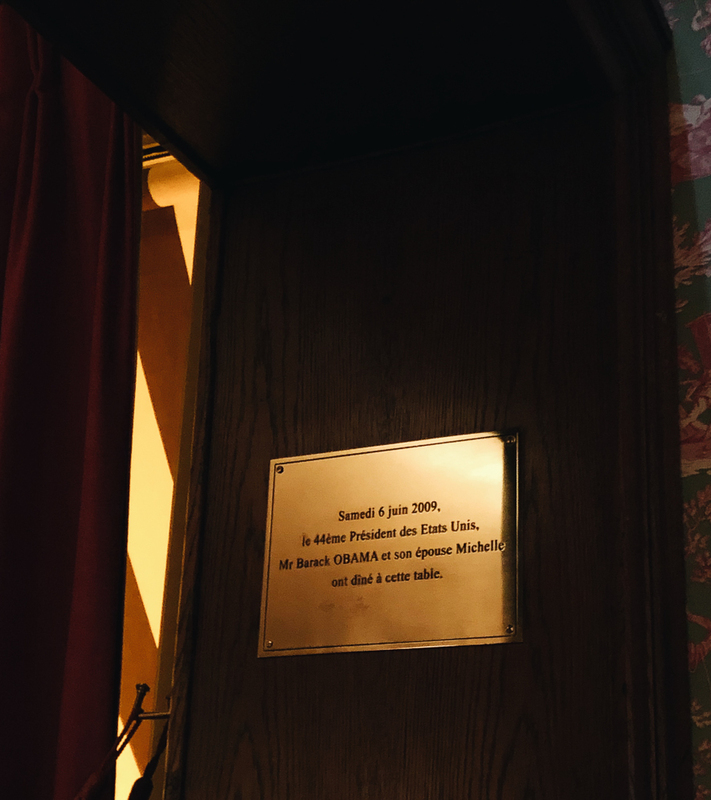 I discovered Les Fontaines de Mars from it’s incredible reviews, and realized when we sat down that we sat at the same table as Michelle and Barack Obama when they dined here back in 2009! When you walk past the restaurant, outside there’s a massive bar covered in crushed ice with baskets of raw seafood. We weren’t sure what it was about, but it all made sense when we saw “Plateau” on the menu. We knew we had to get it, and I can’t recommend it enough. 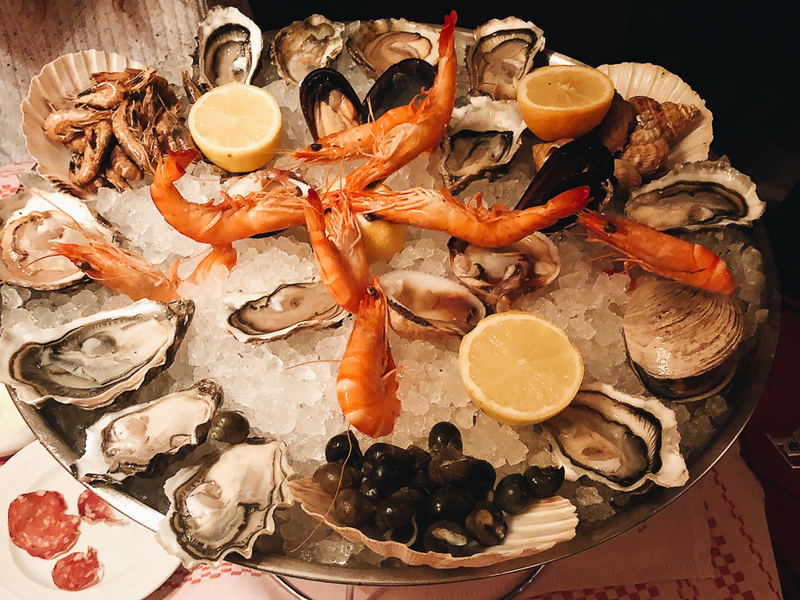 A silver tray appears with raw and cooked seafood, some I had never seen before. We each got an aioli for dipping and a small fork, and went to town. 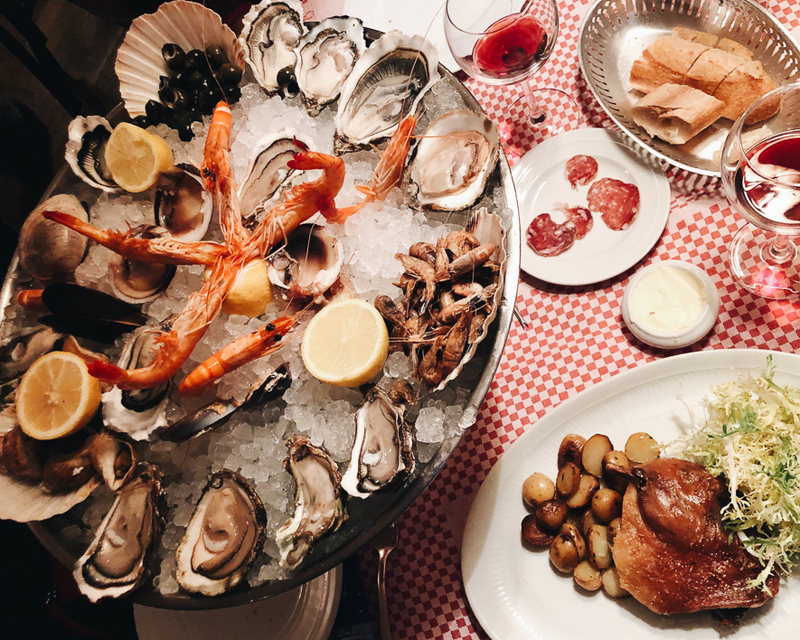 It was so much fun digging the snails and little shrimps out of their shells, and the briny oysters with the sharp mignonette was perfect. 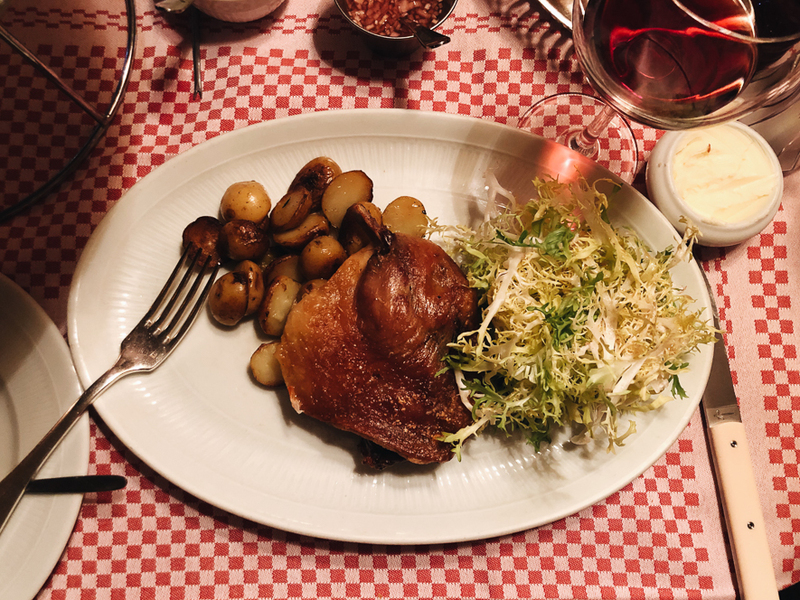 Our waiter highly recommended the duck confit, so of course we had to get that too. It was unbelievably good. the shatteringly crisp and salty skin let way to succulent duck meat, which had a lemony frisee on the side to cut through the richness. 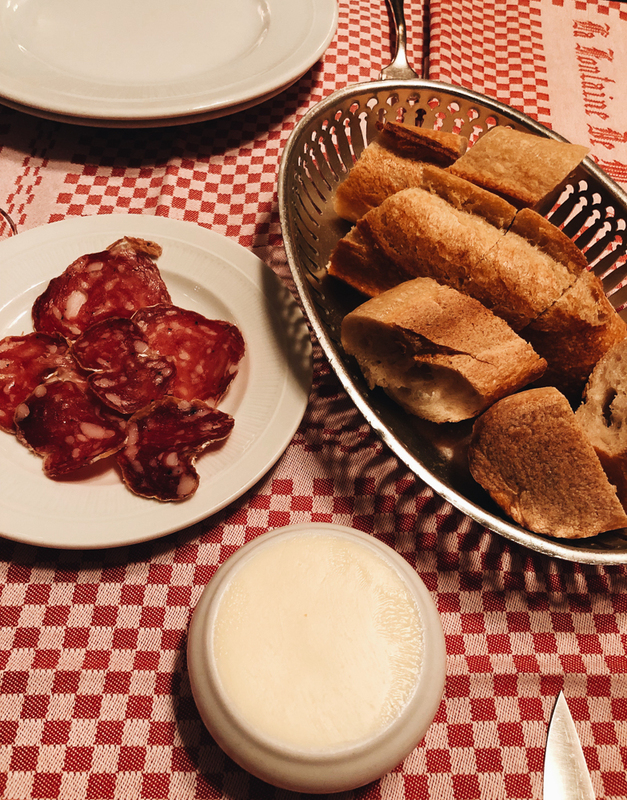 I’m not sure how every restaurant in Paris makes their potatoes so good, and these were no exception. 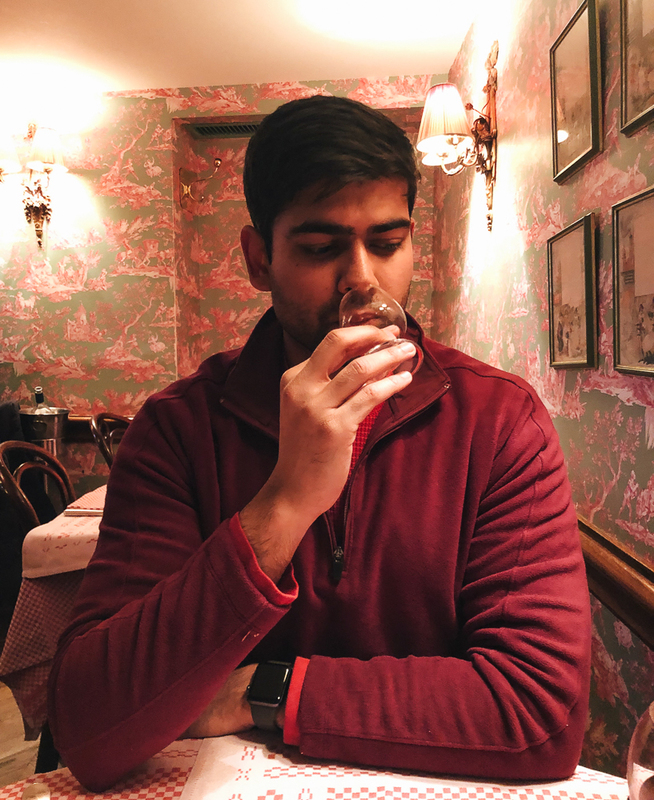 I wasn’t sure how it could get better, until we ordered the creme brulee and chocolate mousse (with the cognac because why stop now??). 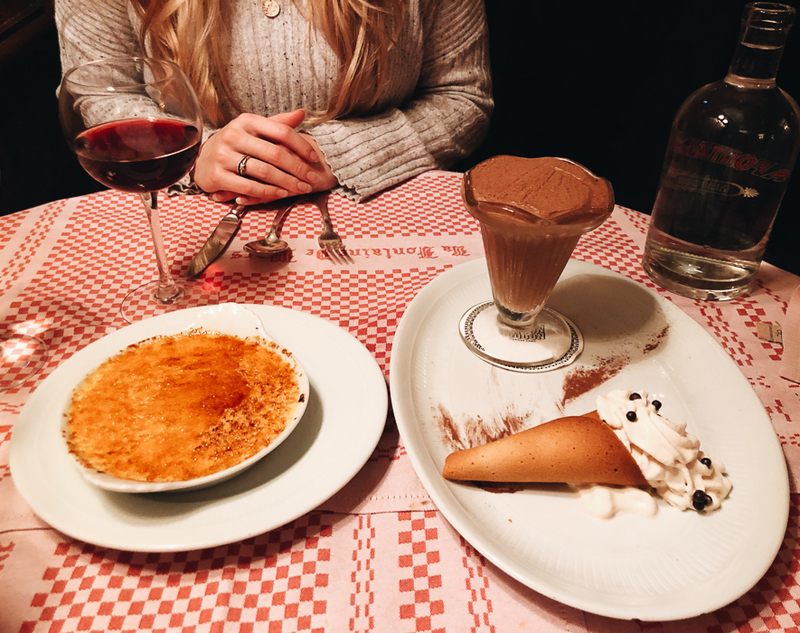 The desserts were heavenly, and we left at a level of full I hadn’t experienced in a few days haha..
An item on my Paris bucket list was to drink wine in front of the Eiffel tower at night. There’s a convenience store a block down from the restaurant, so go there, pick out a bottle of wine, and then the awesome attendant will uncork it for you! 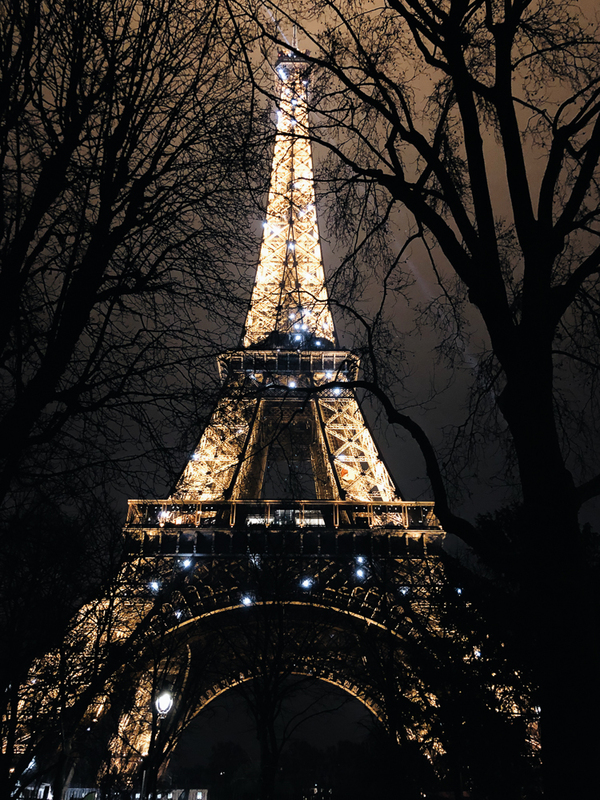 We ended our evening on a park bench, drinking wine out of plastic cups, watching the Eiffel light up at the turn of the hour. If there’s a more perfect evening, I have yet to find it!